Using a fertilizer designed for the needs of tomato plants will help you grow stronger, healthier plants that, in turn, will produce more tomatoes. Tomato-plant fertilizers consist of three main components: nitrogen, phosphorous and potassium. Before planting your tomato plants, apply a tomato fertilizer to the garden's soil at a rate of 1 pound per 100 square feet. Work the fertilizer into the soil, to a depth of 6 inches, with a rototiller. Nitrogen, also referred to as N, is the fertilizer component that contributes to the tomato plant's growth. While it's a good idea to use a fertilizer that contains nitrogen for your tomatoes, the fertilizer should not be high in nitrogen. 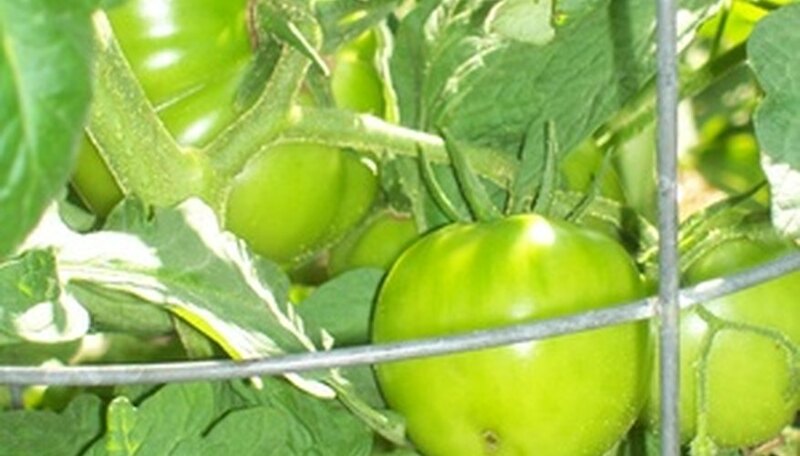 Excessive nitrogen applied to tomato plants results in accelerated leaf and stem growth, but reduced fruit production. A garden fertilizer such as 8-32-16 or 6-24-24 is recommended. The first number represents the percentage of nitrogen in the fertilizer and, as you can see, the nitrogen level is much less than the phosphorus and potassium. Once the tomatoes reach the size of golf balls, add 1 tablespoon of ammonium nitrate around the base of the plant, and again three to six weeks after, to boost tomato size. Phosphorous, often referred to as P, is the fertilizer component responsible for growth of the roots and maturation of the plant. When looking for a tomato fertilizer, choose one in which the phosphorous, always represented by the second of the three numbers, is either the highest number or equal to the last number, which represents potassium. To produce the phosphorous for fertilizer, rock phosphate is treated with acid to make it soluble. Just how much of this soluble phosphorous actually gets to the tomato plant depends on factors such as the soil's moisture content, pH level, minerals and temperature. Soils with a fine texture, such as clay soils, will hold more of the soluble phosphorous than rough, sandy soils. High pH levels and excessive moisture due to high rainfall also lower the level of phosphorous that is absorbed by the tomato plants. The role of potassium, also referred to as K, is not as well known as that of the other two elements. What is known is that potassium is believed to be responsible for the movement of nutrients, carbohydrates and water within the tomato plants, as well as increasing the plant's resistance against disease and insects. This makes it just as essential as nitrogen and phosphorous, because without potassium, tomato plants become stunted and produce fewer tomatoes.